Waiting for the grill to get fired up with a fine Summer Ale by Sierra Nevada called Summerfest, along with the latest edition to my watch collection: the Timex Weekender. I’ve been thinking about getting a Summer watch lately; something that I can bang around in that looks nice but doesn’t cost a fortune. Also, I like the idea of the interchangeable Nato strap because the nylon material is perfect for warmer temperatures, and with so many color combos to choose from, it’s like getting a brand new watch with each strap. 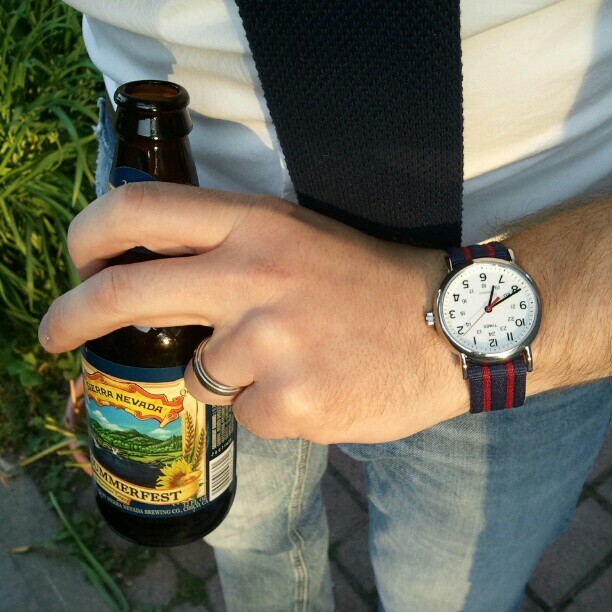 The Timex Weekender was the perfect choice. I will admit that the photo makes the watch look larger than it is in real life, or perhaps I’m just used to a bigger watch face. Still, the longer it’s on my wrist, the more I like it. Tomorrow it will be off to O’Connell’s to acquire so more color options.